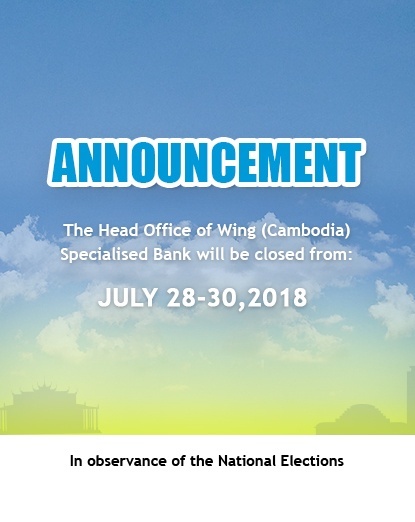 Please be informed that Wing (Cambodia) Limited Specialised Bank shall be closed from 28-30 July in observance of the National Election. To perform any transactions, please visit our office before the date or you can visit the nearest Wing Cash Xpress or Wing Mini agent that are open during the observance of the National Election. You can also cash-in your Wing Account to be able to manage your finances remotely during this period. 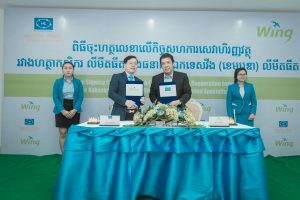 For more information, please do not hesitate to contact us at 023 999 989. Our customer service will be available from 8 am to 5 pm during the period above.